Hamsters are intelligent creatures who require entertainment in order to be happy. 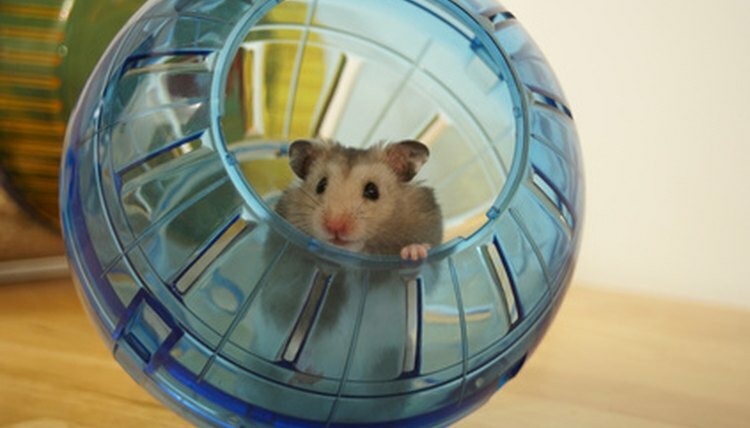 While a wheel can certainly offer entertainment, hamsters can also get bored running on a wheel night after night. Make your hamster as happy as possible by using toys and interacting with your new pet. Sometimes it might even require a bit of creativity at treat time to keep your little guy entertained. A hamster can get his foot caught in the bars of a wire wheel, which can lead to a broken limb. Instead, purchase a wheel that is made of solid, sturdy plastic. It also helps to choose a model that is noiseless so that your pet can enjoy his wheel without driving you nuts. There are a number of interactive hamster toys to choose from. Place a puzzle house in the cage for your hamster to explore. There are also cardboard mazes that provide both entertainment and something to chew on. Make sure the toys you choose are made for hamsters. Never add small toys made for children, as they can choke your hamster or cause intestinal blockage. One of the best interactive toys you can give your hamster is a hollow ball. Hamsters love rolling around the house, checking out all the different sights. Plus, it's great exercise. One mistake hamster owners make is to keep the same toys in the cage. Over time, your hamster will get bored with the same old toys, just as kids often do. By alternating the toys, you keep your hamster entertained without having to buy every toy at the pet shop. Even the wheel should be removed for a couple days at a time to keep the hamster interested in running on it. Sometimes you don't need to provide a toy. The simple act of hiding treats in your hamster's habitat can be like a scavenger hunt for your pet. Hamsters have an incredible sense of smell and will love hunting out their favorite treats. No toy can replace the entertainment a hamster gets from interacting with her owner. Get your hamster out each evening after her daily sleep. This not only offers entertainment, but it also ensures that your pet doesn't revert to her wild behavior, resulting in the need to hand-train her once more.